Early 2015 has been a year of landmark cases, about physician-assisted dying in the Supreme Court of Canada, in addition to the Margot Bentley decision at the BC Court of Appeal. Most of the information available online is academic and focuses on what this means for legislatures (law-makers), but these decisions have implications for Canadians, and people in British Columbia. Different changes to the law could be made across Canada and in each province. If I am incapable, can someone refuse care on my behalf? What are the legal documents that apply? What is the No CPR (Do Not Resuscitate) form? 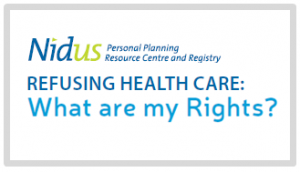 To read more about the law in BC that governs giving, refusing and withdrawing consent for health care, see the new fact sheet by Nidus directly on their website here, and through the Clicklaw website here along with their other resources. Thanks for the post and thank you very much for this website! I’ve migrated to BC 6 months ago and this law database helps my family a lot in our daily life. Very educative and exhaustive. Very comfortable to use. Just know that you’re helping a lot of people!